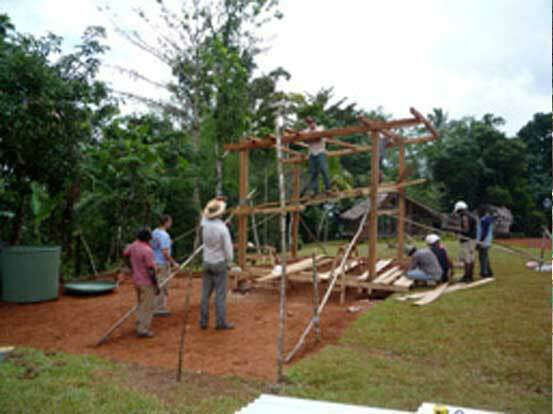 This Bower Studio in the Morobe Province, Papua New Guinea during December 2010 involved the construction of pavilions in two communities. 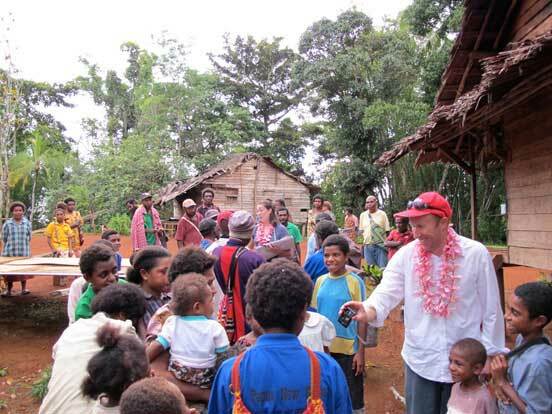 The Serongko village is located on a remote hillside accessible by boat and four-wheel drive a day’s journey from Lae. 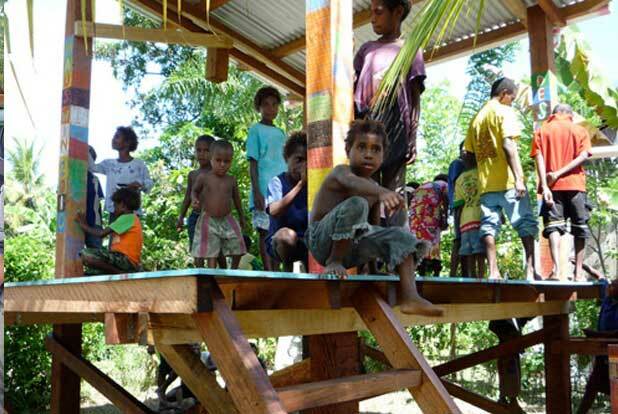 The Bumbu settlement is a shantytown on the outskirts of Lae. 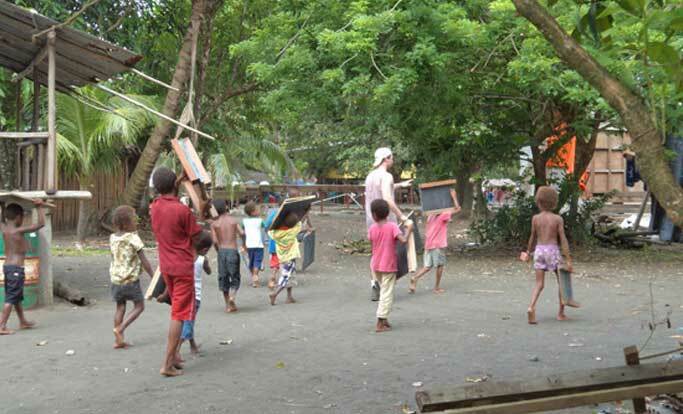 In both locations the people are economically disadvantaged but retain strong cultural links and strong family ties. The houses in Serongko are basic with timber frames and thatched roofs. 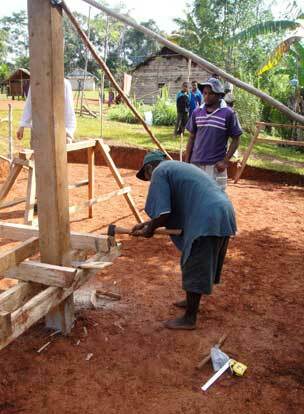 In Bumbu they are built from salvaged scrap. 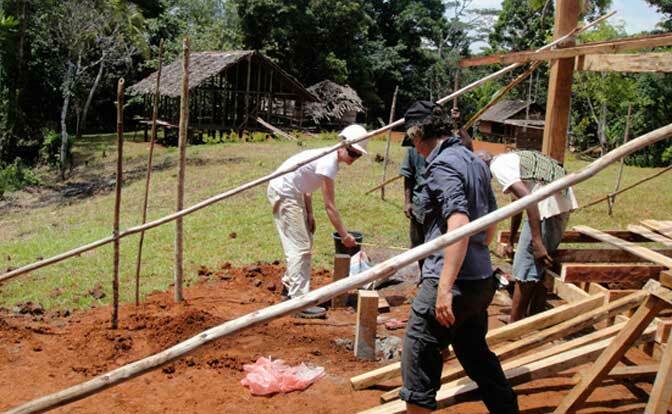 Most importantly the residents of both communities have access to poor water sources that makes many of them quite ill. Much effort is also spent trying to keep dry and houses require a lot of maintenance. While the team understands the benefits of quality housing, particularly in shantytowns, the issue of clean water supplies was important. 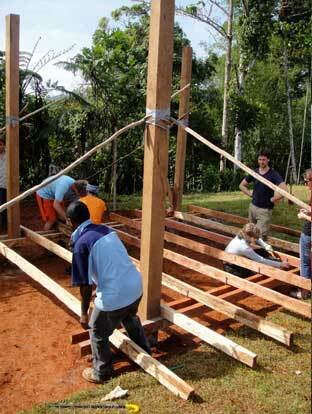 We decided to build ‘hauswins’ – the traditional name for simple shelters. 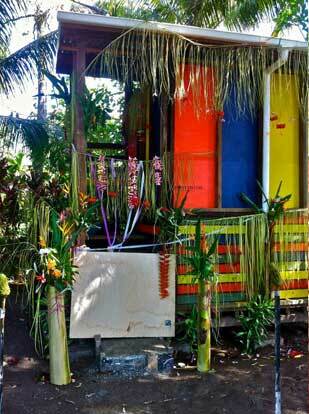 The Bower Studio team incorporated new technologies such as corrugated iron roofs, gutters and water tanks. 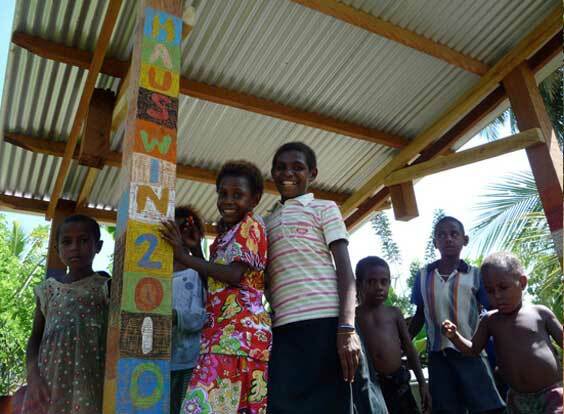 Hence the ‘hauswin’ we constructed in each community provides both shelter and a source of fresh drinking water to reduce the risks associated with the consumption of poor quality water. The construction process was important too. 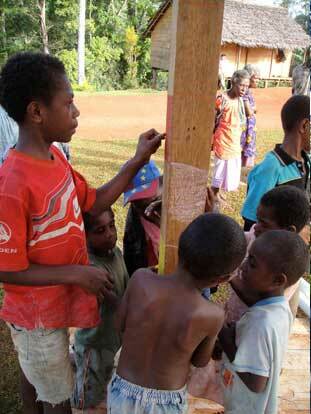 Papua New Guinea is an exporter of timber but much of the wealth this creates is lost to the local community. 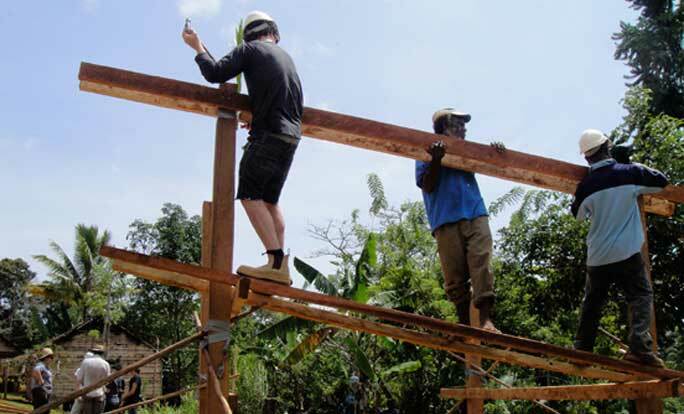 We wished to test if the rural communities could export their own sustainably harvested timber to urban communities and at the same time see if the income this created could be used by the rural people to purchase industrialized materials such as corrugated roofing and water tanks. This ‘technology transfer’ exercise should be economically, culturally and environmentally sustainable and improve health outcomes and opportunities at the local level. 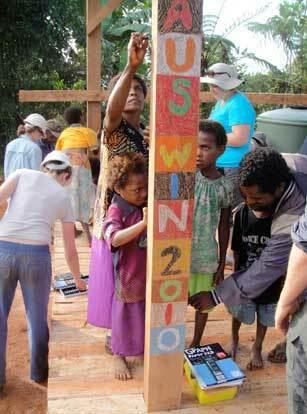 The Serongko villagers were provided with a drawing outlining the timber pieces required for a ‘hauswin’ pavilion and these were carefully harvested from the forests surrounding the community. 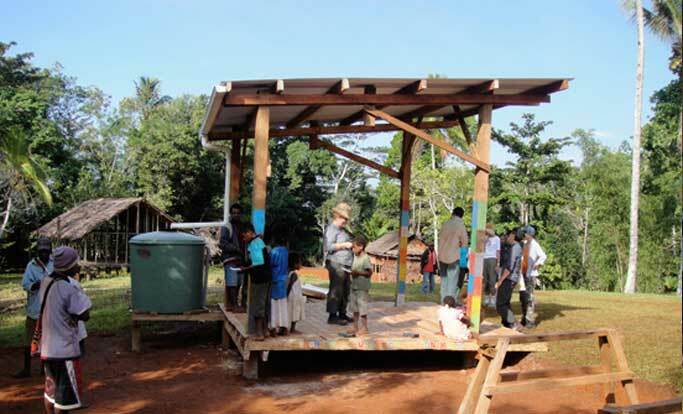 The community then worked together to manufacture the ‘kit of parts’ required and in return were supplied with a corrugated iron roof and water tank. 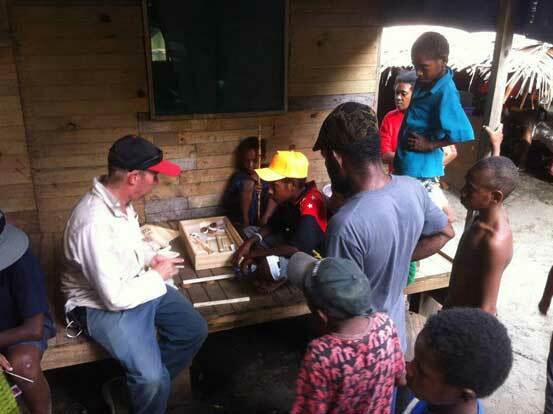 A team from the University of Technology in Lae joined the the University of Melbourne team and together worked to construct the pavilions, firstly in Serongko and upon returning to Lae, in the Bumbu community. These ‘hauswin’ pavilions test ideas about sustainability, improving health outcomes, community development and future housing models. We plan to expand our project and identify new initiatives that improve the health and economic opportunities for residents of these communities.